Do you suffer from knee, back or neck pain? How about arthritis? Consider adding cold laser therapy to your chiropractic care routine. 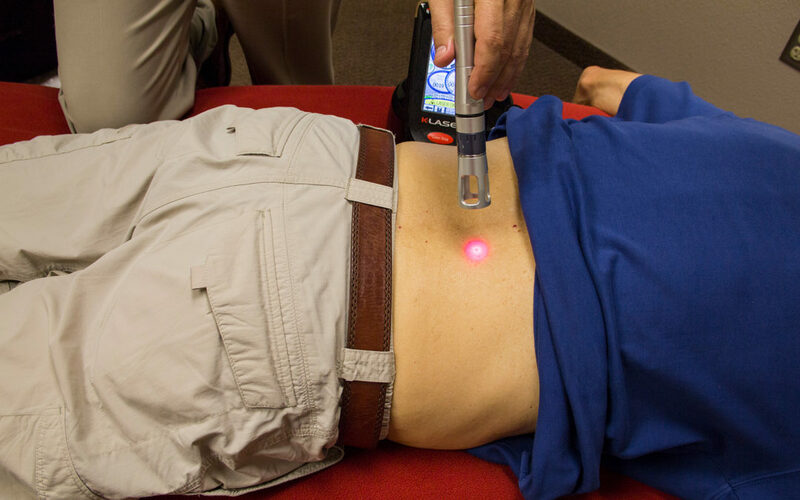 When combined with chiropractic treatments, FDA-approved cold laser in Phoenix can be used to improve many common conditions. Cold laser therapy is a treatment that uses specific wavelengths of light to interact with tissue and accelerate the healing process. It works by increasing cellular energy levels, giving your body more energy to repair itself while decreasing inflammation and pain in the tissue. Laser therapy shuts of pain nerves that are sending pain signals to the brain, so you perceive less pain. Cold lasers also help nerves to heal faster, making lasers an excellent treatment for neuropathy. It also boosts blood flow, getting more nutrients to the affected area for cellular repair. More blood flow = more healing. 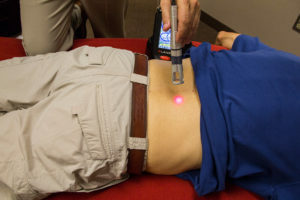 During a typical treatment, a handheld device is placed directly over the injured area for 30 seconds to several minutes. The non-thermal photons of light emitted from the laser pass through the skin’s layers and reach the target area. There, the light is absorbed by the light-sensitive elements in the cell, which helps normalize damaged or injured tissue. The treatment is quick and easy to apply. There is no pain during the procedure. A non-invasive alternative to surgery. It works well as a complement to other treatments like chiropractic care, acupuncture and physical therapy. It’s important to note that laser therapy is a process. It takes a series of treatments to notice improvement. Ready to experience cold laser in Phoenix yourself? At Pure Health & Wellness, our chiropractic care experts have extensive training in the proper application and usage of Cold Laser Therapy. We have had great success in treating and healing many conditions that have not responded to other treatment methods. If you are looking for relief, ask your chiropractor about adding it to your treatment, call us today at 623-243-4097, or schedule your appointment for cold laser in Phoenix.